A leader's most important job is to communicate. Every day, whether in a meeting or a presentation, a water-cooler conversation or a formal speech, his or her ability to craft and deliver a clear message, one the audience will believe, is the tipping point between forgettable and transformational. 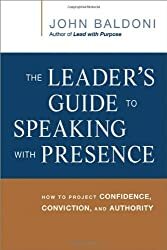 The Leader's Guide to Speaking with Presence is a concise tool kit containing more than 100 practical tips for creating and communicating meaningful messages with presence and authority. Readers will discover how to: present their ideas clearly and provide context; radiate confidence and put the audience at ease; refine their delivery; use stories to inform, involve, and inspire; leverage the energy of any room; convey optimism tempered with reality to gain buy-in; turn PowerPoint presentations into performances; and more. To be truly effective, a leader's words need to ring true, and his or her delivery needs to be authentic. This handy little guide helps readers achieve the kind of genuine presence that leads to lasting trust and quantifiable influence. John Baldoni is an internationally recognized leadership consultant, coach, and author of more than dozen books that have been translated into 10 languages including Mandarin, Hungarian, Arabic, Indonesian, Japanese, Korean, Spanish and Vietnamese. John serves as chair of leadership development at N2Growth, a global leadership consultancy. In 2014, Trust Across America named John to its list of top 100 most trusted business experts. Inc.com named John to its list of top 50 experts for leadership and management. And Global Gurus named John number 11 on its list of top thirty global leadership experts. John was first named to this prestigious list in 2007. John has taught what it means to inspire at the top of a mountain in the Canadian Rockies. At sea level in Orlando, Florida, John spoke to nearly one thousand USAF/JAG commissioned and non-commissioned officers on leadership and communication. And his book, Lead Your Boss, was hailed by Harvard Business Review as a "guide that provides useful advice... [and] is encouraging and inspirational." John began his business career in a fifteenth floor office with a view of a private golf course. Around the corner was a commanding view of the Pacific Ocean. In between was a recording studio where John produced and edited corporate radio spots worked with Fortune 500 executives in leadership communications and development. But John gave that all up to start his own business in the spare bedroom of a beachfront rental more than three decades ago. In time, John established a career as a highly sought after communications and leadership consultant, where he had the privilege of working with senior leaders in virtually every industry from pharmaceutical to real estate, packaged goods to automobiles, and finance to health care. John's newest book is MOXIE: The Secret of Bold and Gusty Leadership, which explores the grit and determination leaders need to exert to overcome challenges. Blending real-life stories with research and interviews, John provides a roadmap for how leaders can lead with greater awareness, more determined purpose and focused engagement in order to achieve inspired results. His tenth book, Lead With Purpose: Giving Your Organization a Reason to Believe in Itself, solidified John's reputation for blending thought-provoking ideas with pragmatic advice. Over the past decade John has established himself as world authority on topics that matter to leaders who are seeking insight into leadership challenges of the day. His 2012 book, The Leader's Pocket Guide: 101 Indispensable Tools, Tips and Techniques for Any Situation, has been recognized as a practical resource for those seeking to improve their leadership skills. His follow-up book, The Leader's Guide to Speaking with Presence, has provided insights that managers need to present their messages and themselves authentically. Through his books and his over 500 columns for leading business publications including Forbes.com, Harvard Business Review, Inc. and many others, John has become a source of practical wisdom on topics such as influencing without authority, applying power appropriately, leading with grace and conviction, and developing genuine followership. All of these topics complement John's mission to help individuals and their organization achieve positive results. John speaks widely to corporate, professional, military and university audiences. Those who attend John's keynotes and workshops find his advice to be practical and his advice inspirations. Mixed with stories of great men and women, and leavened with light-hearted humor, John seeks down-to-earth practical advice that individuals can apply immediately. John's presentations blend his passion for leadership with genuine enthusiasm for helping people achieve their leadership ambitions.